It’s a story so strange the likelihood of it being true didn’t seem credible. According to legend, an Imperial Oil worker was so proud of his company’s paraffin wax that around the year 1900 he had his body entombed in a block of it for burial. The first request, the book states, was indeed granted, and not without some difficulty. But the man’s request to be disinterred half a century later was never fulfilled. The Journal set out to determine if the story was real or “apocryphal,” as the book’s authors admitted it might be. Petrolia town councillor and heritage committee member Liz Welsh had the answer. “It is true,” she said. John McMillan was born in Scotland in 1825. At the age of 37 he sailed for Canada, attracted by profits being made in the oil boom. A born entrepreneur, McMillan assembled investors and founded the Canada Oil and Mineral Company – an early oil refinery. By 1880, he’d become famous as a partner in McMillan, Kitteridge & Co. for his groundbreaking innovations in refining. Business skill and a driving ambition made him one of the largest and best-known oil producers and refiners in Canada. McMillan was mistakenly described in the book as an Imperial Oil employee. In fact, he was one of Petrolia’s original oil men and a 19th century tycoon whose interests included a malt manufacturing business in Kingston, the Cornwall Gas Company, the London Furniture Company, and the Germania Brewing Company of New York. John McMillan died in 1891 at his stately home on Petrolia’s Garfield Avenue, of Bright’s disease, associated with diabetes. Plagued by ill health in his later years, he became eccentric and obsessed with death and the afterlife. That obsession, rather than a desire to tout Imperial’s wax, is a more likely explanation for what became one of Sarnia-Lambton’s strangest burials. It’s even possible McMillan dreamed science would progress so much in 50 years his preserved corpse could be brought back to life. Likewise, he’s contacting David Suzuki and CBC science show host Bob McDonald to see if they might be interested in taking the challenge to the next level. 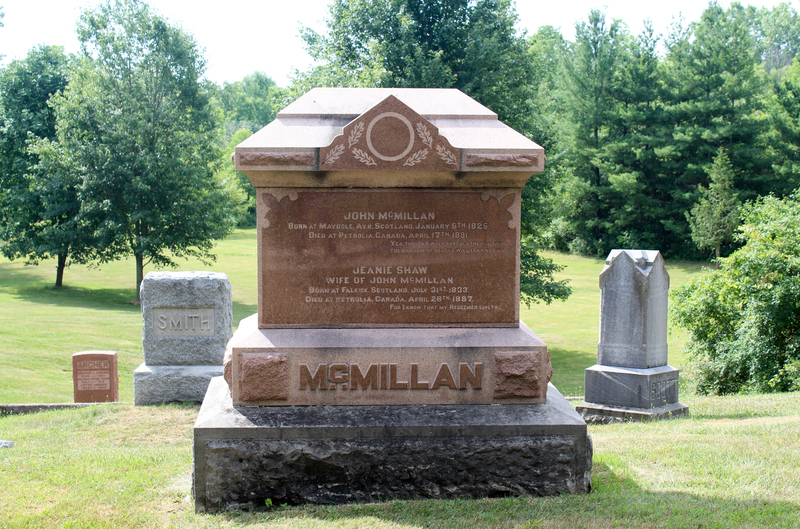 So now, 127 years later, McMillan’s grave at Petrolia’s Hillsdale Cemetery remains undisturbed, his dying wish unfulfilled. But his headstone has become a stop on a fundraising walking tour hosted by the historic graveyard. The next one is planned for Sept. 15.